A folding canoe is the perfect solution if your bug out plans don't allow for big bulky items or your bug out vehicle won't carry the weight of a canoe trailer. While the technology has developed considerably, these canoes have been used across North America and Europe since the 19th century. They are particularly useful for waterways that require portage and for quick bug out getaways as they will come in back pack and suitcase forms. The basic premise of a folding canoe is similar to a pop up tent. You'll receive a bag that has a series of connecting poles, solid plastic panels, and waterproof fabric. The poles connect together to make the skeleton of the canoe and the solid plastic panels provide a firm and watertight base around the sides of the canoe. The fabric will be the hardest part to install, as it will form a skintight layer around the canoe. It will come as one large piece and it can be a two-person job to make sure that it fits perfectly. Folded size and weight - you'll have chosen canoes that fold over their static counterparts, as they'll be much easier to transport as part of your bug out kits. However, you'll still need to think about how big the poles and panels are as this will directly affect the size of the bag that the canoe will come in. A good size will be small enough to strap onto your shoulders as a back pack and should weigh less than 40 pounds, not including the oars. You can buy lightweight aluminum paddles that will weigh less than a couple of pounds that should clip onto the pack. Seating arrangements - most folding canoes will come in at somewhere between 14 and 16 feet in length and the thing that will help you make the choice here is how many people you want to sit in your canoe. If you're planning to use it as a bug out vehicle, then you should be aiming for something around the 16-foot mark with at least three separate seating areas. For a canoe that you'll primarily use for scouting, reconnaissance and food gathering, a shorter boat for one person will be a better bet as it will be lighter and cheaper. Seating coverage - the final option is whether you require additional fabric to cover the top of the canoe. Here your normal weather patterns and the type of waterway you’ll be using will influence your decision. If you live in an area with high annual rainfall levels, extra protection will make sense, as you'll be able to continue to transport goods all year round. You'll also want extra coverage if you plan to take your canoe onto tidal waters as the height of the waves will be unpredictable and you can't afford to lose your canoe, especially when you're out at sea. 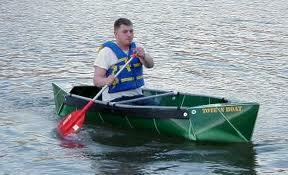 As with all bug out equipment, you should test out each folding canoe before you buy it. These may be as simple as going into a camping store and playing with the different designs for an afternoon, or making contacts on internet forums so you can see the best models in action. Make sure you practice taking it apart and putting it back together a few times so you get a feel for how easy it is and how long it's likely to take you. Are the fittings and materials robust enough to be assembled and disassembled many times over? Or will your intentions be, to build it once at your base camp and leave it in an assembled state? A canoe this versatile cannot be ignored.